WhatsApp Messenger is a messenger application that can be used on smartphones and other devices. The program uses your WiFi (if available) or your 3G connection to let you chat with your family and friends. The application allows you to easily send and receive text messages, audio notes, photos, and videos. WhatsApp Messenger can be used as much as you want. The program uses your Internet connection. You can share media files with your friends, or you can enjoy group conversations with several users all over the world. 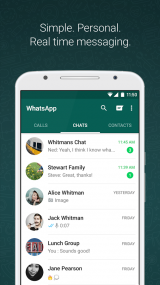 WhatsApp Messenger uses your phone number and integrates very well with your phone address book. The program uses your address book to automatically connect you with your friends and contacts. The users from your address book who have WhatsApp installed will be displayed automatically . WhatsApp Messenger keeps you always connected. Even if your phone is turned off or you miss the notifications, your offline messages will be automatically saved and stored until you retrieve them. By using this small app you will be able to share your location, broadcast messages and MMS to several contacts simultaneously, exchange contacts, set your own custom wallpaper, set custom notification sounds, view message history, etc. No extra costs: WhatsApp uses your smartphone's Internet connection (4G, 3G, 2G, EDGE or Wi-Fi, as available) to send messages and call friends, so you don't need to pay for each message and call. Whatsapp Calling: Call your family and friends using WhatsApp for free, even if they are in a different country. WhatsApp calls use your smartphone's Internet connection rather than your cellular plan's minutes. Uses your Internet connection to communicate with other contacts. Lets you share photos, videos, location and other files.